Using HOVER with Symbility claims management software. Insurance adjusters using Symbility’s cloud-based claims management software can tap into HOVER’s powerful capabilities to receive accurate measurements needed for property claims, including square footage and linear measurements for roofing, siding, windows, doors, soffit, fascia and more. Automatically imports HOVER jobs into Symbility’s claims estimating platform using the claim number. Converts HOVER measurements into a highly accurate 3D roof and exterior plan, allowing adjusters to produce an estimate in a few clicks. Brings in the Measurements PDF and job receipt. Allows users to manually import HOVER jobs in cases where a claim number is entered incorrectly or not at all. Works with both Claims Connect and Mobile Claims platforms. Log in to Claims Connect. Click your name in the top right-hand corner. Click Integration Partners under the Admin heading. Select the HOVER tab at the bottom of the Integration/Interface Partners page. Enter your HOVER account username and password. Note: Within the HOVER tab there are headings for both Administrators and Users. Make sure you scroll down and are entering your credentials under the appropriate heading depending upon your individual role. 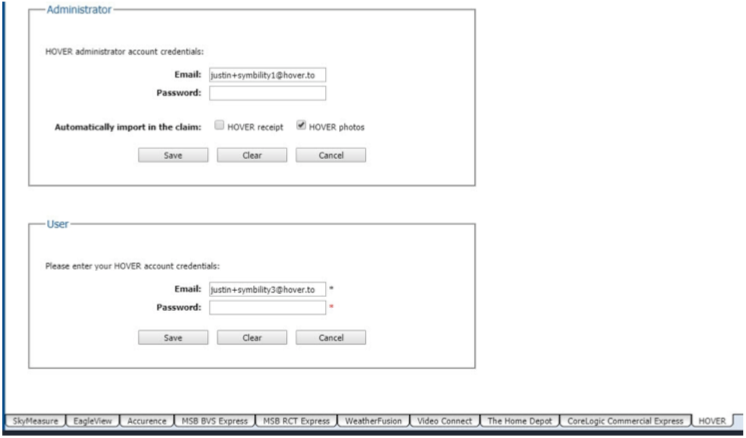 Only one Symbility admin user needs to enter HOVER admin credentials and it will apply to all users in your company. If another Symbility admin enters HOVER admin credentials, it will overwrite the previously entered credentials. Open a claim in Claims Connect. Within the action panel displayed on the right side of the screen, select Integration Partners. You'll now see the Import HOVER job window. This shows you all of the available HOVER jobs to select from. Filter the jobs by choosing to show only your HOVER jobs (all jobs associated with your HOVER username), to view all jobs of your organization, jobs updated since a specific date of your choosing, or search for a job based off of claim number, HOVER job ID, address, or username. Click the job you'd like to work with. You'll then be prompted to select Import. Now that the HOVER job has been imported into your claim you'll see the HOVER Jobs window displaying all imported jobs. You can click the "..." symbol underneath the image thumbnail to see all of your available options. Note: Clicking Import in the top rand-hand corner of this screen will return your view to the Import HOVER Job window where you can select a different job to import. From the HOVER Jobs window select the "..." symbol underneath the image thumbnail. Click Import roofplan. You'll be prompted to confirm the import, to do so, select Import. The roofplan and exterior diagrams have now been generated and are available under Documentation. Select the Documentation tab. Note: If you choose to Import receipt or Open photos from the "..." symbol, these elements will also be found in the Documentation tab. If you select Open measurements you'll view a PDF file with all HOVER information displayed.